Hello guys. Sorry I’ve missed a post or two. I’ve been distracted with my Dad’s hip replacement surgery and a few other personal issues. Nothing big or to be concerned about. Last week I bought a copy of Vogue Knitting as a treat. And love the article about knitting sculptor, Dominique Kaelhler Schweizer, a.k.a Madame Tricot. 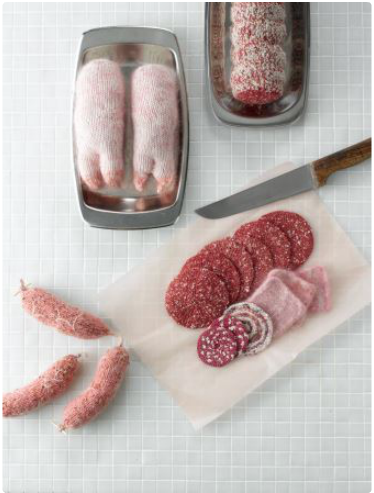 She knits these amazing sculptures of meat, cheese, and other foods. They are as disturbing as they are beautiful. As a trained fine artist I felt so inspired by this. In the past I combined some of my fibre skills into my print making. I miss those days of art – sigh. What non-traditional object d’art would you find most interesting to create? You can view Madame Tricot’s gallery here. Next: Oh yay! Kool Aid dyeing day.